“A riveting scientific detective story” (The Washington Post) by two Pulitzer Prize–winning journalists who chronicle a young Wisconsin boy with a never-before-seen disease and the doctors who save his life by taking a new step into the future of medicine. In this landmark medical narrative, Pulitzer Prize-winning journalists Mark Johnson and Kathleen Gallagher share the story of Nic Volker, the first patient to be saved by a bold breakthrough in medicine—a complete gene sequencing, aimed at finding the cause of an otherwise undiagnosable illness. At just two years old, Nic experienced a brief flicker of pain that signaled the awakening of a new and deadly disease, one that would hurl him and his family into a harrowing journey in search for a lifesaving cure. After his symptoms stump every practitioner, it becomes clear that Nic’s is a one in a billion case, a disease that no one has ever seen before. As Nic and his family search for answers, the scientific community is racing to bring about the next revolution in medicine—translating results from the Human Genome Project to treatments for actual patients. At the forefront is the brilliant geneticist Howard Jacob, who starts a lab at the Medical College of Wisconsin. Then Nic’s head physician reaches out to Jacob with an unprecedented of idea. A disease like Nic’s is likely due to a rare mutation: if they could sequence his genes to try to find the mutation, the boy might live. Jacob doesn’t know if he can do it; Nic’s doctors don’t know if it will even work; and no one knows what else might lie in the Pandora’s Box of Nic’s genome. But they decide to try—and in doing so, they step into a new era of medicine. 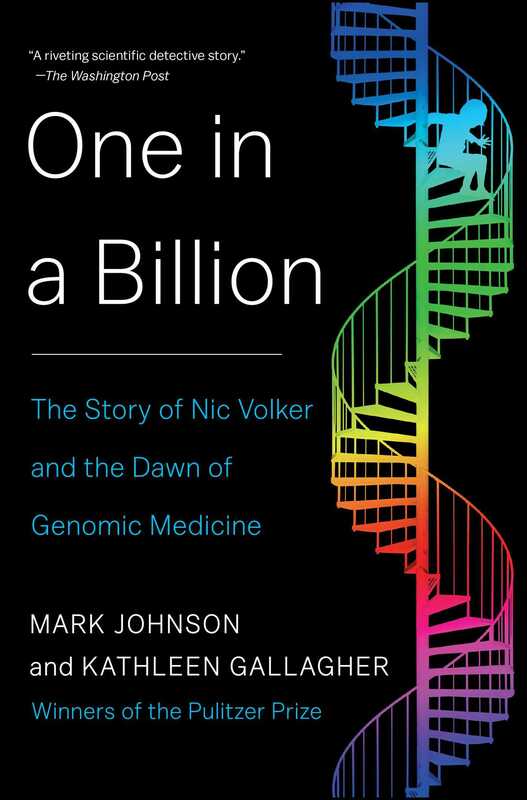 One in a Billion is “a compelling story of a modern medical miracle—the first instance of personalized medicine” (Milwaukee Journal Sentinel) and the birth of a scientific revolution. It may turn out that the roots of love—the mystical force that makes a mother fight to save her sickly son, that drives a doctor to the limits of medicine to keep the boy alive, that stirs scientists to take the first, uncertain steps into a new age in the search for a cure—it may be that this deep, instinctual caring can be traced to one of the smallest, most essential parts of us: the long, pale, winding thread of chemicals deep inside our cells. Our genetic script. Our personal code. Our DNA. It was a century and a half ago that the Austrian monk Gregor Mendel famously experimented with pea plants, showing how they pass physical traits from one generation to the next. His research provided the first insight into why some of us are short or tall, brown-eyed or blue-eyed, hairy or bald. In the many decades since, scientists have pinned these traits to genes, distinct chunks of DNA that together tell the story of all we carry with us into our brief life on earth: the risks we face, the quirks we display, the diseases we may be destined to endure. To what extent we’re the sum of our genes, we cannot say. Scientists are still in the early stages of exploring the genome. But with each passing year, they move ever closer to the fundamental mysteries behind the genes we inherit and how they interact with our environment and upbringing to shape us as human beings. James Watson and Francis Crick, who discovered DNA’s double helix, did not foresee such grand inquiries into the origins of our traits and diseases when they began their quest to find the secret of life. For them, “the secret,” as Crick called it, was simply the structure of DNA, the chemical form in which all of Mendel’s traits were spelled out and stored within our cells. When they discovered the double helix in 1953, it was the answer to a chemistry puzzle. They never considered that it might one day be possible to read the code. Yet their work established a foundation upon which others built. In 1977, British and American scientists devised the first techniques for reading the genetic code. And at the turn of this century, a massive effort involving hundreds of researchers using hundreds of complex machines succeeded in unveiling the entire sequence of our DNA, the human genome. The ability to read our genome has led humans to a place that Mendel, Watson, and Crick could scarcely have imagined, a place that forces us to confront profound questions of fate and chance. Gains in computing speed and capacity are bringing the cost down so rapidly that it is inevitable that our descendants will have their DNA sequenced at birth. After decades of debate, the ethical issues and fears surrounding these changes are crossing from hypothetical to real. And at the forefront is a new form of medicine—one that seeks to make sense of human complexity, to sift through thousands of harmless differences in the genetic script, to find the errors and defects that threaten our survival, and to use this new knowledge to treat patients in need. Pioneers of this nascent medicine—a remarkable team of doctors and scientists and a family with a very sick child—came together in Wisconsin in the summer of 2009. Their story has reverberated around the globe, and it won’t be long before most of us find that, to one degree or another, our lives are shaped by what our doctors find in that genetic script. So where does the script begin? Imagine a tiny camera, smaller and more powerful than any now in existence, small enough to pass through skin, deep into the human body, into the blood. The camera slips inside one of the body’s basic units, a single white blood cell. Then it penetrates the cell’s dark nucleus. There lie the twenty-three matched pairs of chromosomes that contain our essence, the DNA that makes us who we are and determines our risks for cancer, heart disease, and many other illnesses that can change the course of our lives. Risks force us to confront our limited time on earth, to make the decisions that come to define us. Should we finally visit the Sistine Chapel or the Great Pyramid at Giza? Is it time to change careers? Should we renounce hamburgers, exercise more, and take cholesterol-lowering drugs, all for a better chance at a longer life? Until very recently the risks inscribed in our genes were inaccessible to us. Today, with companies such as 23andMe allowing us to glimpse a snapshot of the script, we are entering an age in which our genes may come to possess an almost Delphic power over us. Our imaginary camera moves onward, deeper into the blood cell, into the nucleus, into a chromosome. The chromosome consists of hundreds of genes, each one a basic unit of heredity, a set of instructions for brown eyes, red hair, or male-pattern baldness. The camera passes into one of these genes and travels along the two coiled strands of DNA. The strands form the double helix, a structure resembling two side-by-side, winding tape measures that pass through all of the chromosomes. Linking the two strands are 3.2 billion rungs, like steps on a ladder. At each rung sit two chemical bases. There are only four possibilities for the bases: cytosine, guanine, adenine, or thymine, commonly reduced to the shorthand C, G, A, or T.
The camera stops, focusing on one of the two letters on a single rung, the tiniest portion of one gene. A point among 3.2 billion points inside the nucleus of a blood cell. A place so small that it must be magnified seven million times using a powerful electron microscope in order to be seen. It could be anyone’s blood cell. But it isn’t. This lonely milepost rests inside the body of a four-year-old boy who loves Batman and squirt-gun fights and bouncing on his hospital bed. He loves steak, but he seldom gets to eat it. Most of the time, the boy’s food comes in liquid form, seeping into his bloodstream through an intravenous line. Doctors have been forced to take desperate measures to save the boy. Holes, tiny pencil pricks, have been forming inside the child’s intestines whenever he eats real food, a life-threatening condition. No one knows the reason for the havoc inside the child’s intestine. It is a mystery doctors have been struggling to solve for two years and counting, but to no avail. Without an answer they can barely keep up with his symptoms. How can they fight a disease they cannot explain? They have no camera to scan the double helix. They do not know what secrets it holds. What a terrible disease, thinks Amylynne Santiago Volker, as she waits with her son in the holding area outside the operating room. Other families sit nearby, but it is obvious from their nervous eyes that being here is different for them—an unusual experience, frightening and new. For Amylynne and four-year-old Nic there is nothing new about the trip to the operating room at Children’s Hospital of Wisconsin. By early 2009, the trips have become routine. Routine to a degree most could not imagine. Today’s trek to the operating room is just one in a series of more than a hundred for Nic, a never-ending exercise in futility that began more than two years earlier when his mother found a strange abscess on his bottom. Since then his intestine has been ravaged by tiny holes called fistulas, which form after he eats food; this is why so much of his nutrition must come through an intravenous line. The holes cause stool to drain onto his abdomen, raising the constant threat of infection. Nic’s disease has doctors so baffled that they cannot come up with a way to stop new holes from sprouting. The best they can do is try to stave off infections. So almost every day, Amylynne sits with Nic until it’s time for the anesthesiologist to put him to sleep; then the boy’s surgeon, Marjorie Arca, cleans the same wound she has cleaned dozens of times before. Nic, a small boy with bright blue eyes and a toddler’s high-pitched voice, waits to begin his day in the operating room the way other children wait to begin theirs in day care or kindergarten. In the holding area on this June morning, Nic is the only kid who appears dressed for Halloween. His blue eyes stare out from a Batman mask. His body, so small for his age, is cloaked in a Batman cape. His hands wear Batman gloves that make the sound Ka-pow! He marches around the hospital as if it were his backyard. In the midst of a marathon stay that will exceed 250 days, the hospital has, in essence, replaced home. Amylynne, a striking, dark-haired woman of Filipino descent, is in her early forties and carries herself like none of the other parents in the hospital. Like them, she has cried this morning. But she has already cleaned up her face and reapplied her makeup to hide her worry from Nic. As many times as she walks her son to the operating room, her anxiety about the anesthesia that will put him under never wanes. Unlike other parents, she has learned to hide it. Unlike other parents, she knows the receptionists by name, the social workers, the nurses. She knows whether they have boyfriends or husbands, whether they have children, whether they jog or work out at the gym. Nothing about Amylynne is passive, not anymore. She monitors every aspect of her son’s care and decides who should be on his team, not just doctors but nurses, too. She searches the Internet and medical reports for clues to Nic’s disease and possible treatments. Raised in a medical family and schooled by her son’s illness, she has gained enough confidence in her hunches to share them with the doctors. When she disagrees with their decisions, she tells them. She is determined to be taken seriously; the doctors have no idea how far she will go. She will change how she looks, how she acts. She will argue with staff and make enemies if she has to. Her devotion to Nic, her love, makes her more formidable than any other parent these doctors have encountered. Some of the staff know that this mother is virtually living at the hospital. Some have seen her curl up beside Nic at night. She’s not supposed to sleep with her son, but she wants to be close and there are few opportunities in the hospital. The nurses are not about to tell this woman that she cannot sleep beside the son she may soon lose. What amazes the nurses is how, after sitting beside her son late into the night, Amylynne manages to get up, style her hair, and put on a fresh business suit as if headed to another day at the office. If the hospital has become Nic’s de facto home, his health has become Amylynne’s twenty-four-hour-a-day job. Everything else in her life seems trivial by comparison. What the other parents in the holding area and the doctors and nurses do not see is the cumulative toll that so many trips to the operating room have taken. They do not see the entries in her journal, agonizing over each new disappointment, each failure to find a cause, each new hole the doctors find. Nic craves food. Pizza. Steak. In the hospital, he falls asleep some nights clutching a bag of Bagel Bites the way other children cuddle teddy bears. Amylynne must play the killjoy. She tells her son it may be a long time before he eats normal food, then listens to him howl in frustration, this little boy who is already severely underweight. The disease punishes him for eating and punishes him when he doesn’t. When she is not cataloging the insults of his illness, Amylynne, a born-again Christian, fills her online journal with affirmations of her faith. “God is good all the time,” she writes, though the words sometimes sound like more of a reminder to herself. Often she prays with Arca, the surgeon, or with Nic. When the stabbing pain in his abdomen grows unbearable, Nic asks her to pray for him. An entire routine has evolved around Nic’s near-daily trips to the operating room. He selects music. He picks a flavor of oxygen. He holds the mask through which the oxygen flows. If residents try to hold the mask, he pushes their hands away. Others control most of what goes on in his world, poking needles into his body, taking blood whenever they please, taking his temperature when all he wants is to play. What little control he has, even over something as trivial as holding an oxygen mask, he clings to. The day’s routine begins with a simple act that encapsulates for Amylynne the pain and frustration of these last two years. When it is time, when the doctor is ready, Amylynne carries Nic to the operating room. She stops at a line marked on the floor, the point she cannot cross without wearing scrubs, the point where she must leave her son with the doctors. Here she is forced to entrust his fragile life to modern medicine. But in Nic’s case, medicine appears to have reached a similar line. Centuries of progress toward understanding heredity and genes have left doctors at a threshold. When a patient has a known genetic illness, there is often a test that can confirm it. And in some cases, scientists have figured out how to fix the defect or compensate for it. However, when doctors have spoken to Amylynne, all they have been able to do is tell her the diseases Nic does not have. They have run tests on individual genes and on his immune system. They have said that his problem resembles known illnesses. Yet it hasn’t responded to known treatments. Lately the message from doctors has been that he appears to have a new disease, something no one has ever seen. Something found nowhere in the millions of entries in medical journals. If the illness is new, there is no test to confirm it. There is no understanding of the cause and no clear picture of what is happening inside Nic. Why does the simple act of eating—something we all do, something we must do to survive—cause Nic such terrible pain and put his life in peril? The doctors do not understand the problem they are trying to fix. So Nic and his family have set out on what is known in medicine as a diagnostic odyssey. They have gone from one expert to another, one theory to another—and now they are back at Children’s Hospital of Wisconsin, where they have spent the majority of Nic’s illness, where the doctors know them and the staff refuses to give up. Amylynne is tired, but she has not exhausted all hope; her capacity for hope seems endless. Someone, she knows, will figure out her son’s disease in time to save him. Somewhere there is an answer. It is a strong conviction, but not blind faith. Many of her relatives are doctors. She knows that medicine is ever advancing, exploring new ideas. Among scientists, excitement has been building around one of those ideas. Ever since the completion of the Human Genome Project’s first draft in 2001, researchers have been seeking to apply knowledge of the genome to human health. This is the next frontier: the chance to bring genomics into the realm of medicine, to treat real patients who have puzzling diseases and nowhere else to turn. Thousands of human diseases are caused by a single mutation in an individual gene, and the Human Genome Project has raised, for the first time, the possibility of sequencing all 21,000 or so of a person’s genes. If it works, gene sequencing could transform medicine and alter millions of lives. It would allow scientists to hunt for mutations on an unheard-of scale. So far researchers have traced the origins of some five thousand rare diseases to specific flaws in our genetic script. They’re still hunting for the defects responsible for another two to three thousand single-gene disorders. And while they may prove more difficult to treat, complex, multigene disorders are also yielding some of their secrets to the technology of genetic sequencing. The ability to scan the genome now brings them all within the grasp of modern medicine. Imagine a single tool that could pinpoint the causes of so much suffering. These rare mutations and diseases are only rare when viewed individually. Taken together, rare diseases, most of them hereditary, afflict 25 million to 30 million Americans, roughly one in ten. Nic’s hopes, like theirs, may hinge upon the promise of genomic medicine. This boy, though unknown to the hundreds of scientists working to harness the power of our genetic script, may present the very opportunity they have been seeking: to translate the mammoth genome project into medicine. Without knowing it, the Volkers have come to American medicine at a crucial time. Pioneering scientists have been anticipating, even staking their careers on, the arrival of a child like Nic, someone with a new disease that requires a new medicine. There is no way to know when the moment will come; doctors and scientists can only hope that when it does, they are ready. Much is at stake. Medical breakthroughs require risk and can release unintended consequences. For every new treatment that succeeds, others fail, setting back the advance of science and, worse, harming patients. But for Nic and Amylynne, there is little comfort in the conventional methods that keep failing against an unconventional disease. Where scientists see risk, Amylynne sees possibility, the chance to escape their grim routine. At the line marking the operating room’s entrance, Amylynne waits to pass her boy to the surgeon and a medical system that is so far mystified. She hugs and kisses Nic and tells him good-bye. Then she hands over her only son. Mark Johnson is a health and science reporter at the Milwaukee Journal Sentinel, where he has worked since 2000. He was a member of the Journal Sentinel team that won the Pulitzer Prize for explanatory reporting on the Nic Volker story in 2011. He is also a three-time finalist for the Pulitzer Prize and has won numerous other awards for his reporting. He lives with his wife and son in Fox Point, WI. "A compelling story of a modern medical miracle — the first instance of personalized medicine." "A dramatic chronicle of how a team of doctors and scientists collaborated to save the life of a young boy suffering from a rare genetic disease and, in the process, played an important part in launching personalized medicine. ... The exciting tale of a major medical milestone."